Please go through the link which has my question. All the details I've included there. The first row is question and the second one options. Which comes next in this sequencing question? 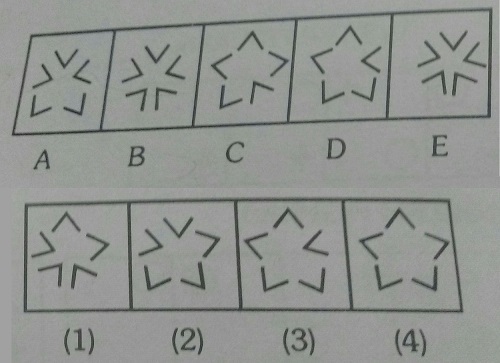 This question(first row cited as A B C D) contains 4 patterns and I want to know among the options given(the second row with pics cited as 12 3 4) which one comes next after the last in the sequencing. The number of 'V's that flip each step alternate between 2 and 4. Therefore, the next step will have 3 'V's pointing in, and 2 'V's pointing out. (1) is the only option that fits this. Not the answer you're looking for? Browse other questions tagged pattern visual connections-puzzle or ask your own question. Here is the link of a non verbal pattern sequencing question.can anyone help me with that?